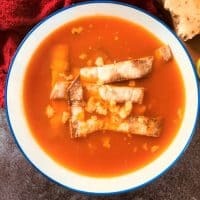 There are many different varieties of Mexican soup with probably the most well known being Tortilla Soup. It can be cooked with or without chicken. Tortilla soup nearly always includes a tomato base, garlic, onion and chilies. 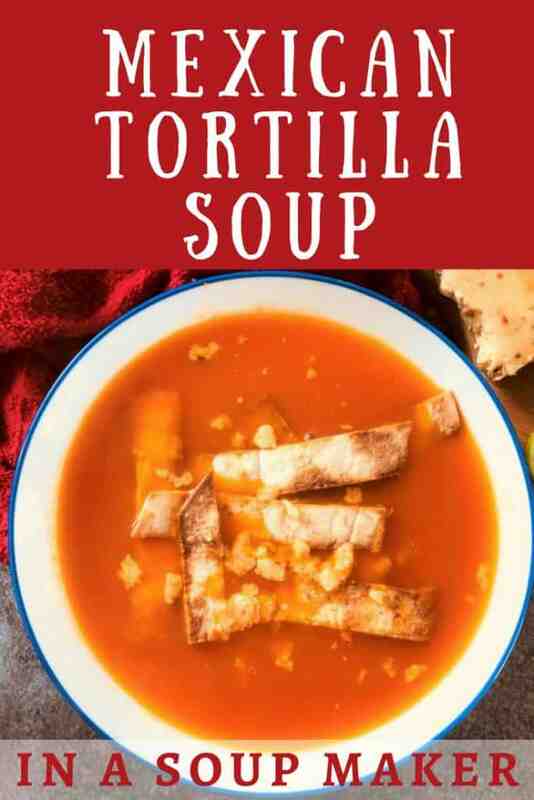 The tortilla is usually cut into strips and fried before being dipped into the soup. If you prefer you can just buy supermarket tortilla chips and serve them on the side or crumble some over the top. This soup was made in my Morphy Richards Soup Maker, but it can also be made in a saucepan on the hob. 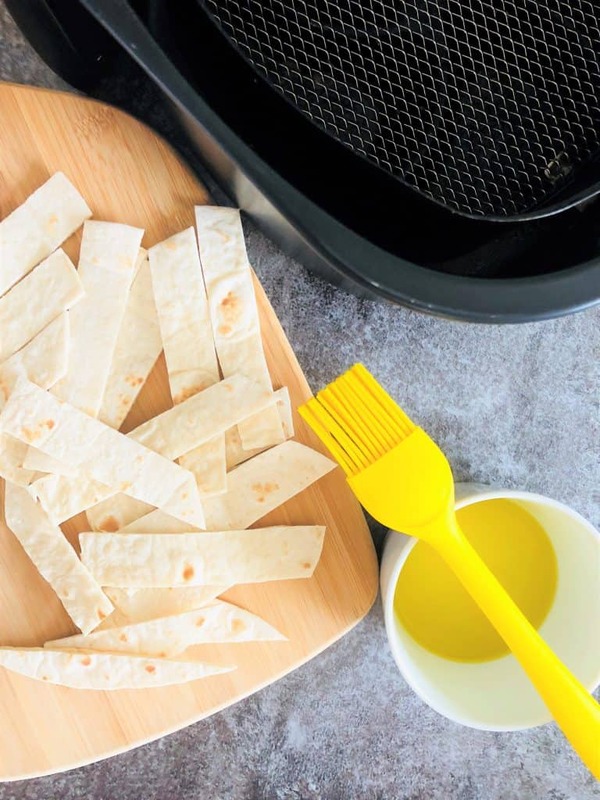 To make your own tortilla strips/chips to dip in just cut up a tortilla wrap into thin slices, brush with a little oil, sprinkle with some seasoning (I also added a pinch of smoked paprika) and cook at 200C for about 5 minutes. I made these ones in my air fryer, but you can use an oven too. You can be as free with the spices as you choose. For this recipe, aside from the fresh chopped red chilli, I have added a tsp of ground cumin, but I sometimes add in a little smoked paprika. The spices work well with the lime juice – I used the juice of 2 limes, but you can use just 1 if you prefer. If you want to add in some chicken you can add it in at the end, a few minutes before the soup cycle is due to finish. Use 1 cooked chicken breast and shred it before putting it in. Give it a good stir to make sure no ingredients get stuck to the bottom. Turn on to the smooth setting. Serve with tortilla crisps/strips and cheese melted on top. 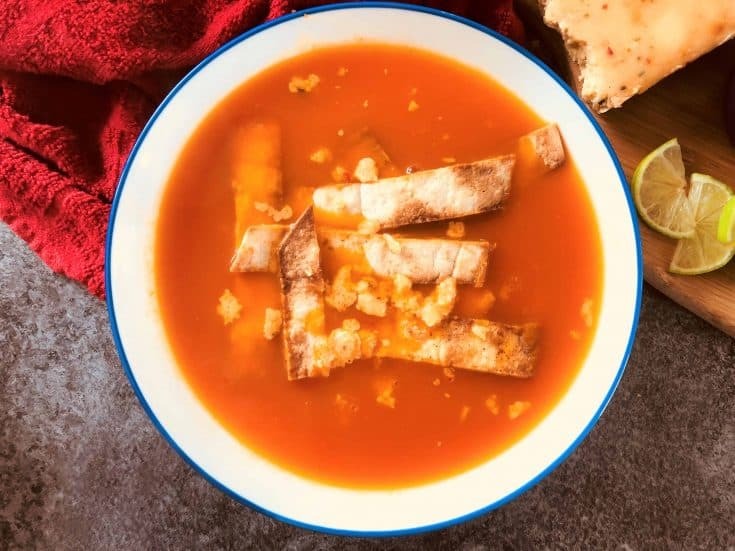 To make tortilla strips at home: Slice up a tortilla wrap into strips, brush with some oil, season according to taste (I also added smoked paprika) and cook at 200C for 5 minutes.